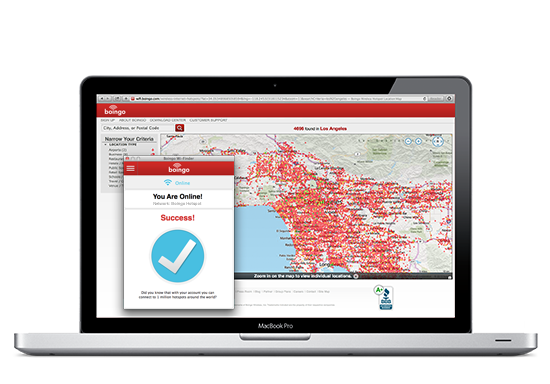 Connect securely to more than 1,000,000 Wi-Fi hotspots worldwide on your Macintosh laptop with Boingo Wi-Finder. 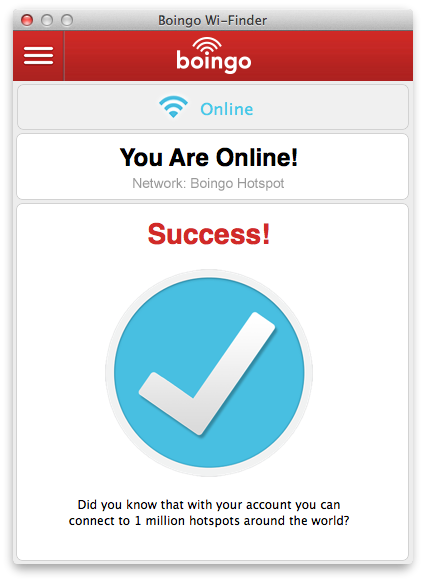 Boingo Wi-Finder will help you find thousands of free and Boingo hotspots around the world. Even better — the app automatically connects you to free hotspots, so getting online is a snap! Plus, in our latest release, we’ve included security features that make connecting better than ever. Once you download and install Boingo Wi-Finder, it gets to work! Wi-Finder actively searches for Wi-Fi hotspot signals and alerts you when one is found. Wondering what Wi-Fi network to connect to? Worry no more. Set Wi-Finder to automatically connect to commercial free hotspots and Boingo Wi-Finder will select the best connection to get you online. With an active Boingo subscription or AsYouGo account, you can connect to Wi-Fi at more than 1,000,000 Boingo hotspots around the world, including airports, hotels, coffee shops, stadiums, and more. Boingo Wi-Finder will alert you when you’re in a Boingo hotspot, and get you connected in one click. Interested in driving tech savvy customers to your business? Find out how to add a hotspot to Wi-Finder. For information on how to exclude your network from Boingo Wi-Finder please visit Network Exclusion Information.